My Life as a Reflux Mum: Ideas for Helping a Reflux Baby Get to Sleep. 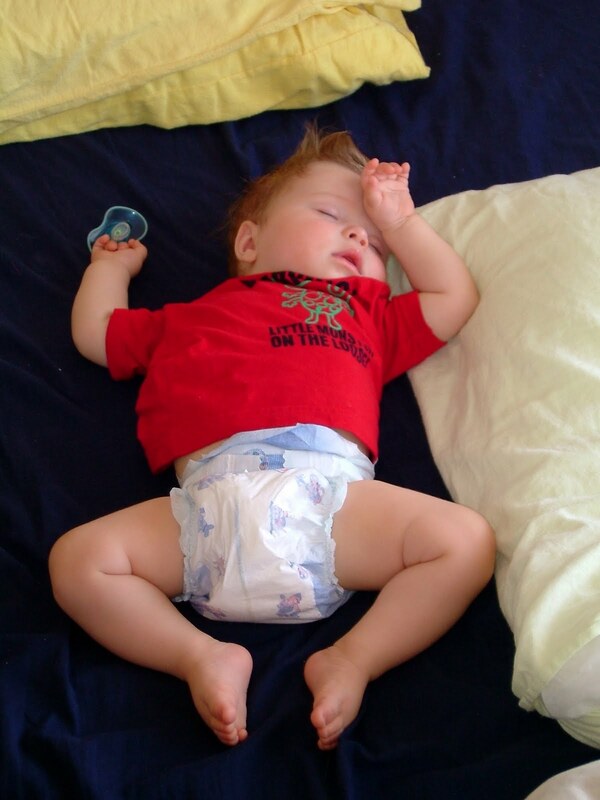 Ideas for Helping a Reflux Baby Get to Sleep. Finding it hard to get your Reflux baby to sleep? Here are a few ideas that I can remember to help get a baby, who is in pain, to sleep. I'm sure these would work with a baby without Reflux issues too, but it is probably best not to get into the habit of assisting a baby to sleep when you don't really need to. Flynnie out to it. Four months old. - One major thing to remember is to raise the head of their cot so they aren't lying flat. You want to try and keep that food and acid down in their tummies. By raising the head of the cot you're letting gravity help a little. A wonderful way to get a baby to sleep is called the swoosh manoeuvre. Atleast that's what I think it's called, I learnt about it five years ago and my memory is a bit hazy! But basically you hold baby in your arms facing out, your legs apart and slightly bent, then twist at your waist and twist while saying “shshshsh”. Works most of the time. All babies seem to love quite vigorous movements. Whether it is in a buggy being pushed over the edge of the carpet for a little bump in the road, taking them for a walk outside either in your front pack or in the buggy (remember to have the buggy seat raised, not lying flat! ), or simply jiggling them in your arms or in the bouncer. I remember when I went to the Parent Centre for the first time, seeing how hard they rocked the babies and being really surprised, I always thought you were supposed to gently sway, but my kids certainly didn't respond to being gently swayed, they liked it rough;) So I'm grateful for learning that little tip from them. I did have people take my babies from me and tell me they could get them to sleep, it was very thoughtful of them and I'm sure they just wanted to give me a rest, but it used to drive me crazy because I knew what they were doing wasn't going to work, and all the while my baby was getting more and more over tired and distressed, giving me a harder job to get them to sleep when they decided to give up. Patting them in the same place helps to settle them too, they seem to like the repetition. Sometimes they just want to be close to you. I remember for a while I slept with Flynn at night, I would go to bed so early with him and he had to sleep right up under my armpit. He just loved to be so close. That didn't last long though because we all were waking each other up all night. When my children were over the Reflux (Flynn was nine months and Chase was one years old), then we had to work on their sleeping habits. Flynn was a breeze, it took him one night to figure out what he was supposed to do. But I think deep down he really was always a good sleeper, before the effects of Reflux kicked in he slept like a log. Chase on the other hand never slept well from the word go. He took ages to figure out the sleeping thing, he was very stubborn and it wasn't until he was about two that he slept through the night. Things to do During Pregnancy. Tricks for Getting Baby to Feed. Trust Your Gut When Seeking a Doctor.